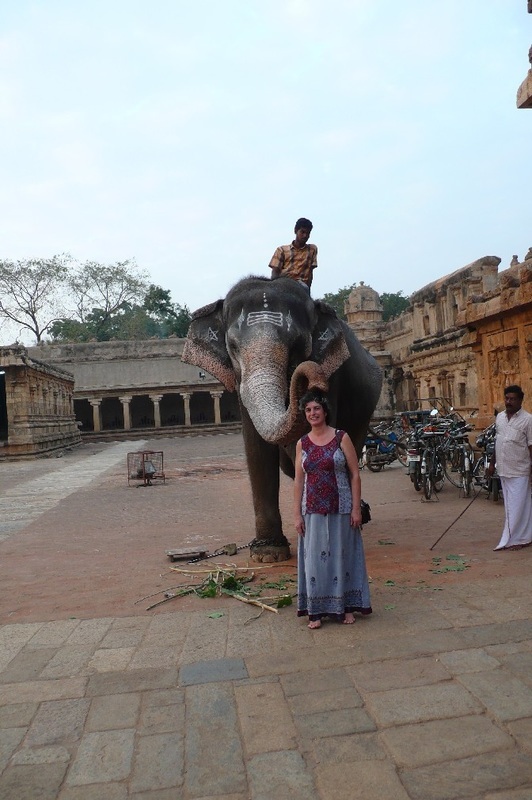 This is a quick summary of a trip that we took to South India. We were invited to meet our daughter-in-law's grandmother in Goa, and decided that we should play the role of tourist in South India first. 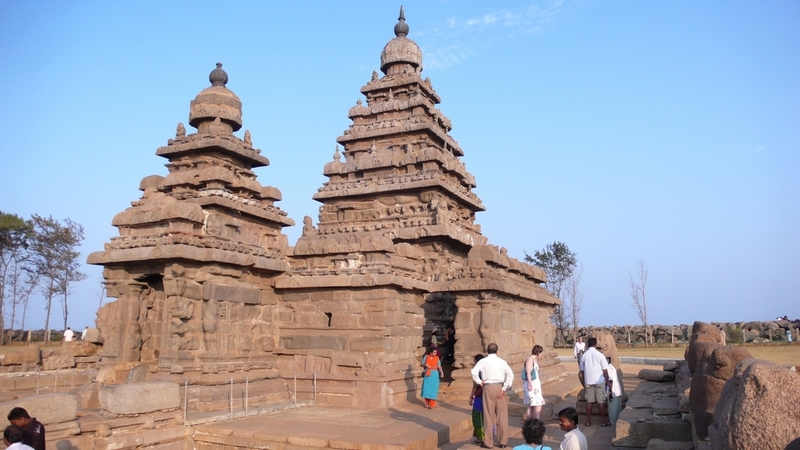 With the help of Discovery Tours of India, and with very little notice, we embarked upon an 11-day tour across South India, arriving in Chennai (previously called Madras) in Tamil Nadu on the Bay of Bengal, and driving across Tamil Nadu through Kerala to Kochi (previously called Cochin). From there, we flew to Goa to meet the family. The flight from London to Chennai took 10½ hours. We had the pleasure of sharing our row on the plane with a British-Indian woman who was coming ‘home’ to see family. She told us we would really enjoy Goa. In retrospect, she may have said this because Goa has westernized in a sad way,and she may have thought the familiarity would be exciting. Looking down upon Tamil Nadu from the window of the plane it was clear that this south-east Indian state was not familiar territory. While there were many lights on the ground below, it was far from the busy, bright scenes of the Western cities that we know. Once on the ground, getting through immigration was remarkably easy and there were no hassles from enthusiastic porters or others. We soon saw a serious-looking young man with a neatly trimmed moustache holding a sign with my name on it. I waved to him, and he soon met us along with another man who was the agent for Discovery Tours. It was already after 2:00 AM and we were soon in a clean, white SUV listening to the musical exchange of Tamil dialogue between our two new acquaintances. Words and phrases seemed to finish in a long series of repeated syllables drawn ticklishly from throat to ear like a series of identical marbles. 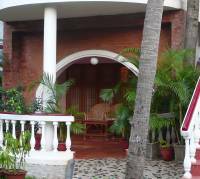 The agent informed us that we would go straight to the hotel in Mahabalipuram (also called Mamallapuram) where we would settle up. This would take him out of his way, with a 90-minute drive to and from the hotel and an additional trip back to the hotel for the driver. I offered to settle up right away, and he was very obliged, but at no time did he suggest we do so. He and the driver were perfectly willing to make the trips and seemed sincerely surprised and grateful. We left him at his house and headed off, with the driver, who told us his name was John Paul, clearly concerned that he may not actually know the way to the highway without the agent. We were to discover that John had a modest opinion of his abilities. He asked me a little shyly if it would be all right if he stopped to ask directions. By this point I was sitting in the front with him and of course consented, but no sooner had I done so than he saw what he was looking for and we set off upon a quiet highway. The signage was in an unrecognizable mixture of scripts combined with English ones calling out to us. 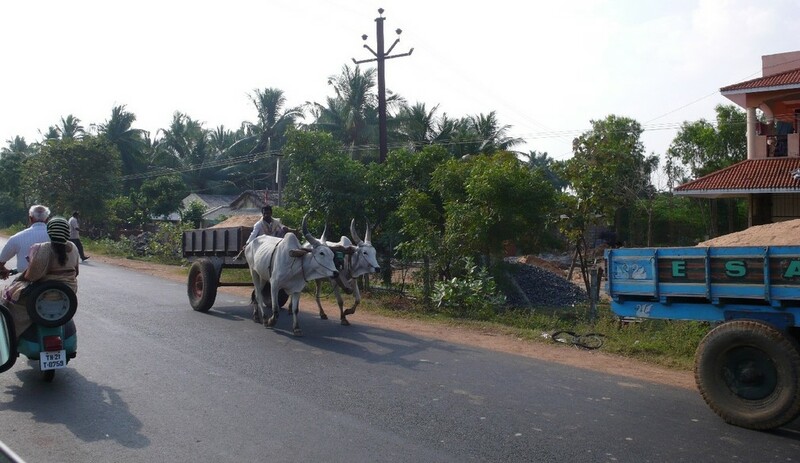 Once on the flat, well-built, empty road, the diesel engine purred along carrying us at around 60 km/hr with evidence that the Bay of Bengal was just a ways off to our left. While we saw some other traffic-even at that time of night-and the occasional domestic animal at the roadside, the trip was without incident and we began to learn a lot about the region from John. He talked comfortably with a healthy dose of cynicism about Tamil Nadu, politics, and life in general. A quiet man who was willing to drive in silence, he gave thought to our questions and answered them clearly. Around 3:30 AM, we arrived at the Ideal Beach Resort, a welcome place to recover from a long flight. Naturally, we had to wake people up, but we were soon in a lovely room with two large single beds. We never used the second one. After the constant noise of the plane, we turned off everything mechanical and went to sleep resigned to some strange noises eminating from behind our bathroom wall. In time we would learn that night noises were unavoidable and often unexplainable. When we awoke, it was not late, and were eager to explore. Breakfast was the first adventure, and we were soon tasting tomato and cucumber curries with dosa (a thin pancake painted with egg). Altaf Chapri, one of the owners of Discovery Journeys, had told us that our first stay would be at a quality beach resort where we would stay for two nights, giving us a chance to catch our breath. He did not exaggerate. The beach was quiet despite the busy season, and was equipped for relaxation with hammocks strung between palm trees overlooking the water, a lunch bar, and a team of stewards to hand us towels, deliver drinks and rake the beach. 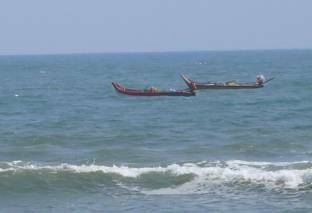 We were soon swimming in the Bay of Bengal. Off to the side, there were a series of fishing boats, and we could see that, other than the resort, the beach was used actively the way it probably has been used for generations. It was not dominated with rich estates, but just a normal looking series of fields and simple homes with only the occasional exception that spoke perhaps of a future of vacation homes. The Front Desk employee had told me that I had a safe in the room, but I could not make it work. He promised that someone would come by right away to check it. After a long wait in my room, watching the sunny day drift by, I returned to the desk. He responded to my mild frustration with a strange headshake that we learned is a significant expression in South India body language. It is something that is so natural, one assumes that it is unconscious. Somewhere between yes, no, maybe and I understand, it is an endearing physical expression that you might see an affectionate little boy show his mother. It is disarming and once we began to figure it out, we realized that it says a lot of things. In this case, I understood it to mean that I was wasting a beautiful vacation day waiting for someone who would never come, and that I should know that if something is impossible to do, no-one will inform me, and that he felt my pain. Aside from this gentle way of being told off, we had been warned to forget our preconceptions of a tropical sense of time. We would find our guides arrived punctually and expected us to do the same. At 2:30 PM, our guide and driver arrived to take us on our 3:00 PM tour. 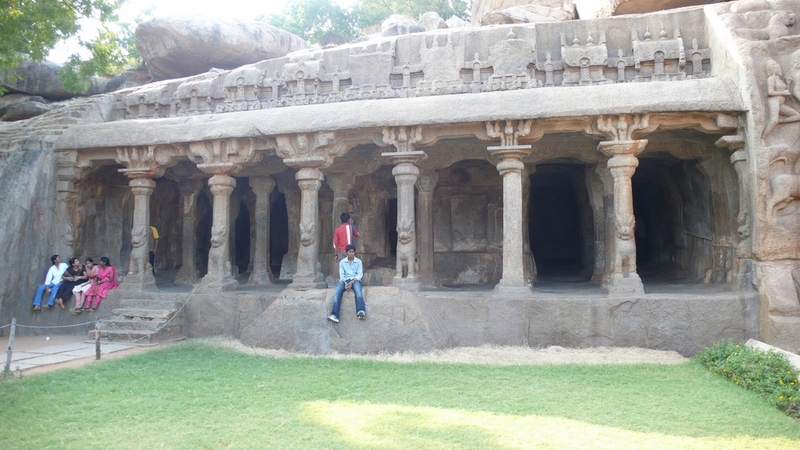 We were soon on our way to see fascinating granite temples that had been carved out of, and into, solid rock. They were thought to date to the 8th century, in the time of a Palava ruler called Mamalla who lent his name to the place. The best-known carving is a bas-relief that has been interpreted as telling two different stories. One school of thought believes that it tells a flood story of the creation of the Ganges River, and the other, the story of Arjuna’s Penance. While the Ganges flows out of the Himalayas and meets the sea at Calcutta, way to the north of Tamil Nadu, the carving is considered to be one of the most famous representations of the Ganges flood story and in this interpretation is called The Descent of Ganga. All life watches Shiva disburse the waters of the Ganges through his hair, thus saving the world from drowning. Arjuna, on the other hand, was the reluctant warrior for whom Krishna was the charioteer. 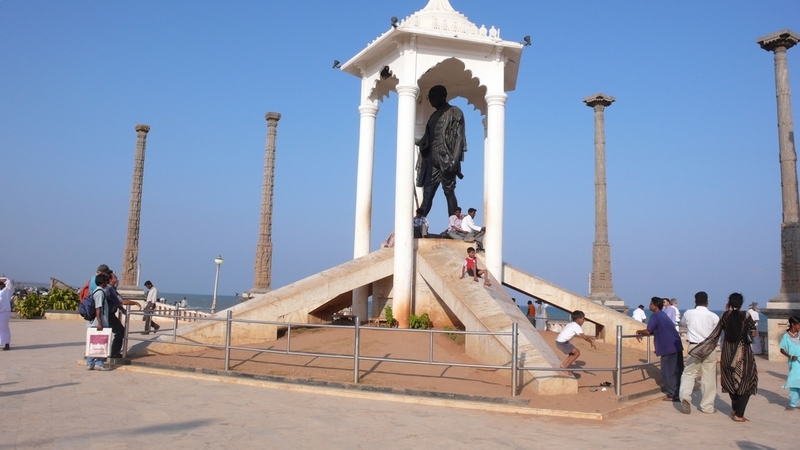 In this alternate interpretation, he is doing penance to obtain strength in battle from Shiva In both cases, Shiva is honoured, and his influence is evident right across Tamil Nadu. The mural is an enormous piece of work carved skillfully around a natural indentation that was formed by a creek. The Descent of Ganga or Arjuna’s Penance? 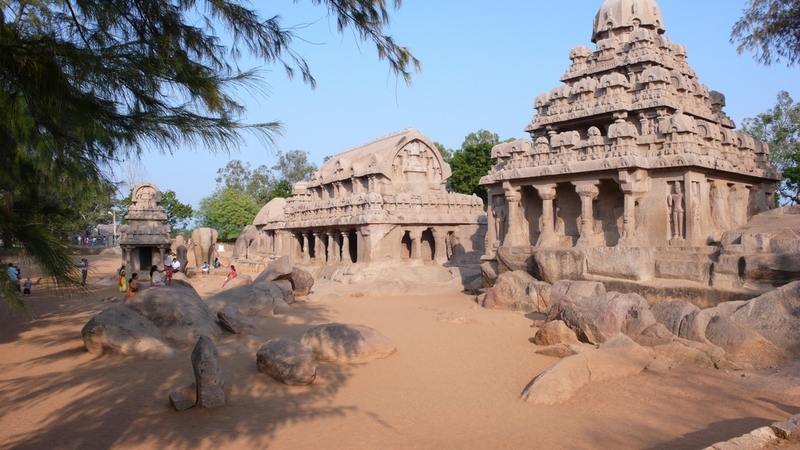 The first site we visited had a series of temples carved out of – and into – solid granite outcroppings. Our guide explained the four types of structures, which were the caves, the monolithic carved buildings (made from a single rock), the masonry structures, and the bas-relief mentioned above. 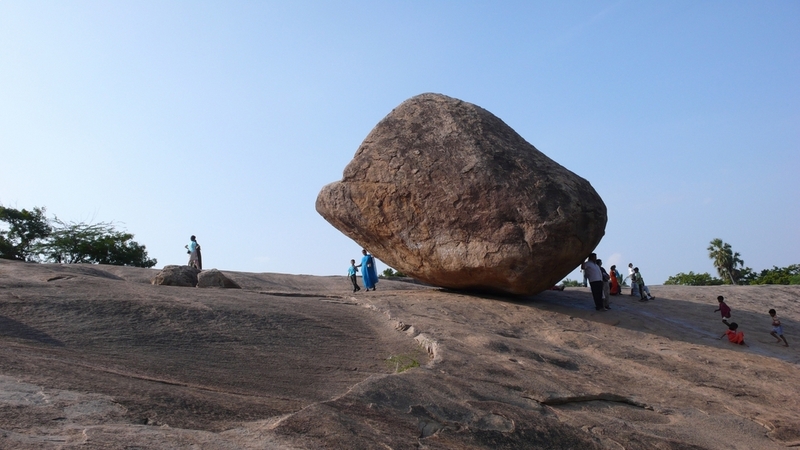 For the children, there is also the butterball, a huge rock that has been sitting precariously on the rocky slope above the grounds for as many centuries as people can recall. This cave is cut into the same rock as the bas-relief and is right beside it. Detail carved on the wall. 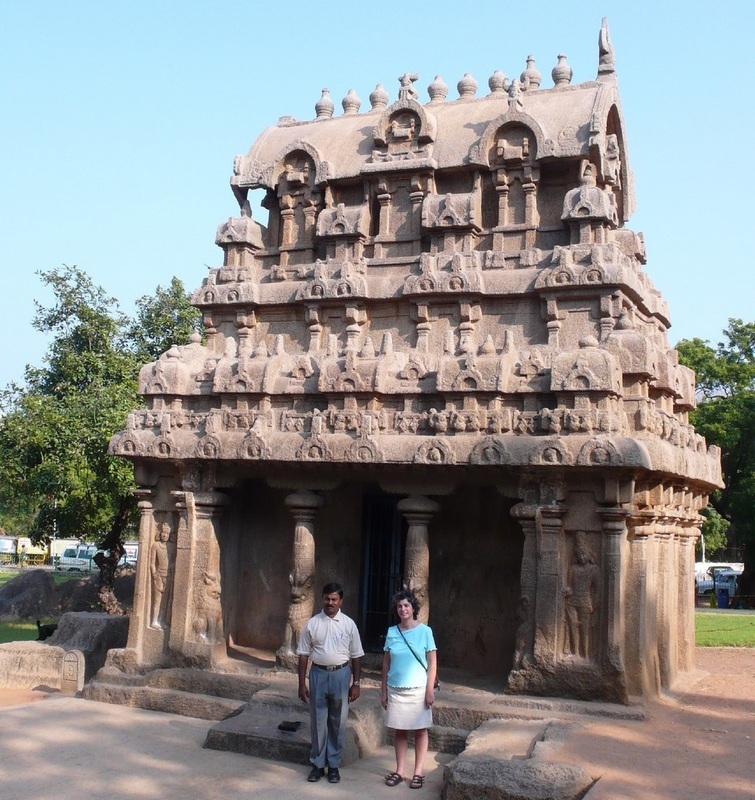 Sheila and the guide stand in front of a temple carved from a single stone. A short drive away was another compound where four buildings and three full-sized animals were carved from a single, huge rock outcropping. It is thought to have been the site of a school for carvers. 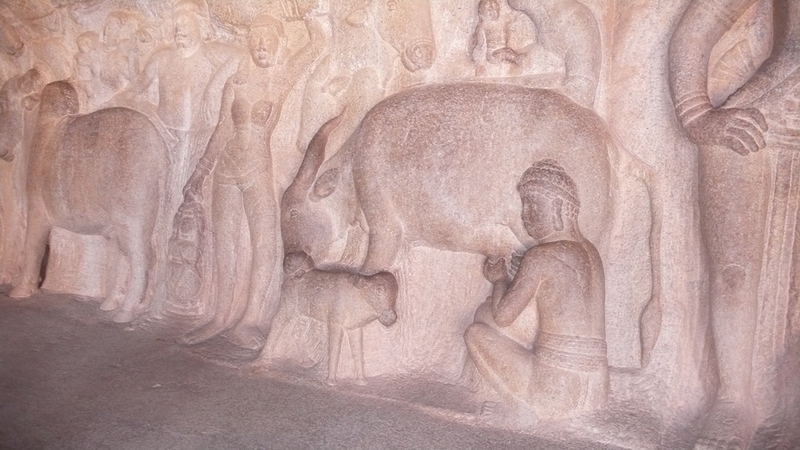 Temples and animals carved from the bedrock. Another short drive took us to the masonry temple on the shore of the Bay of Bengal where myth had it that seven temples once existed. There was no archaeological record of any others, and many experts dismissed the myth, until the tsunami of December 2005 revealed evidence of ruins for a few moments as the sea receded. 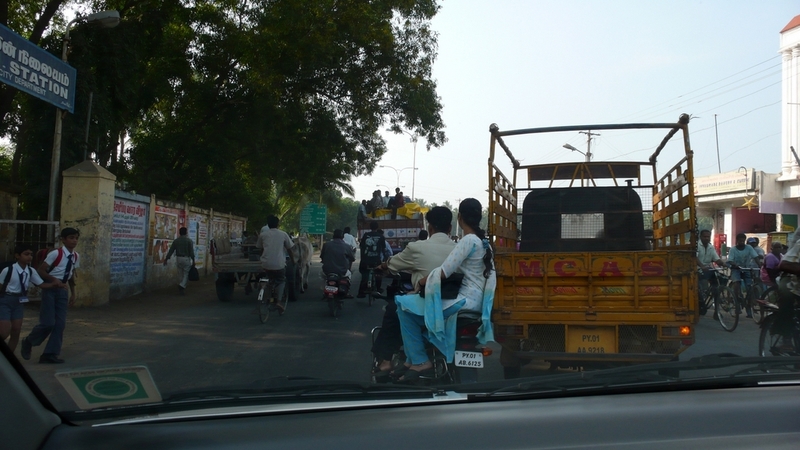 On January 7th, we left early to travel to Pondicherry, a distance of 120 km. It took about three hours, as anticipated. The daytime roadways are chaotically busy, but the traffic flows smoothly. John is a professional driver. In a country like ours, where every teenager drives, his professional status does not resonate. 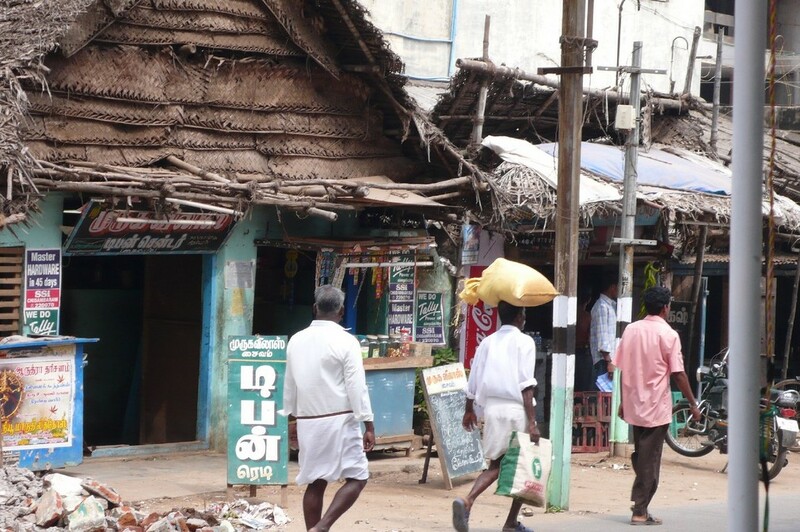 However, we were learning that the roads in South India are a culture of their own, and we were traveling with a man of great status in this environment. 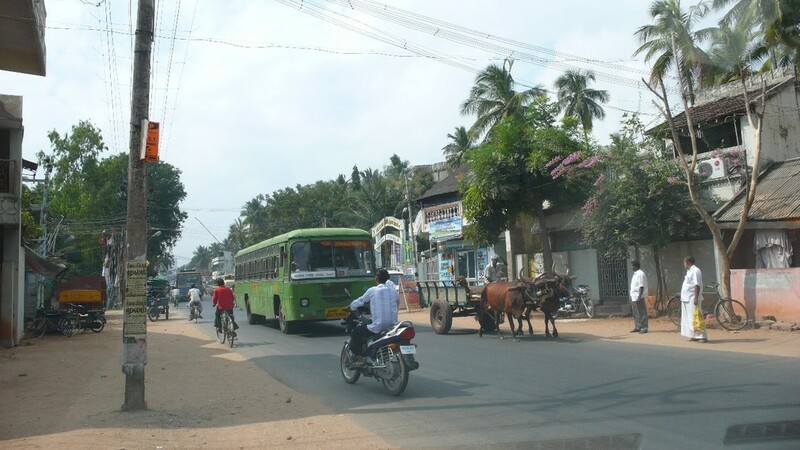 Given the presence of trucks, buses, cars of all sizes, three-wheel taxis, bicycles with two people onboard, every variety of motorcycle, some carrying a family of four or five, the mother sitting crosswise in a colourful sari sometimes with a child on her lap, ox-carts, occasionally with sleeping drivers, and pedestrians -- coupled with the absence of sidewalks in many locations -- and no willingness on the part of anyone to slow down, the driver has to know the culture and have split-second timing. The traffic may be chaotic, but it is not haphazard. There are rules and there is a discipline. We experienced fewer traffic slow-downs than we do in Canada, and even with the volume of traffic, we saw only two accidents over 18 days. I am sitting to the left of the driver. This concrete pole is rushing at me as we move to the left to accommodate an oncoming bus that is overtaking the ox-cart. We narrowly missed the concrete telephone pole, but it was all in a day's work for John Paul, our driver. Traffic is moving quickly in both directions, but the whole road expands to absorb the busier lane. Note the two boys walking out from the left. 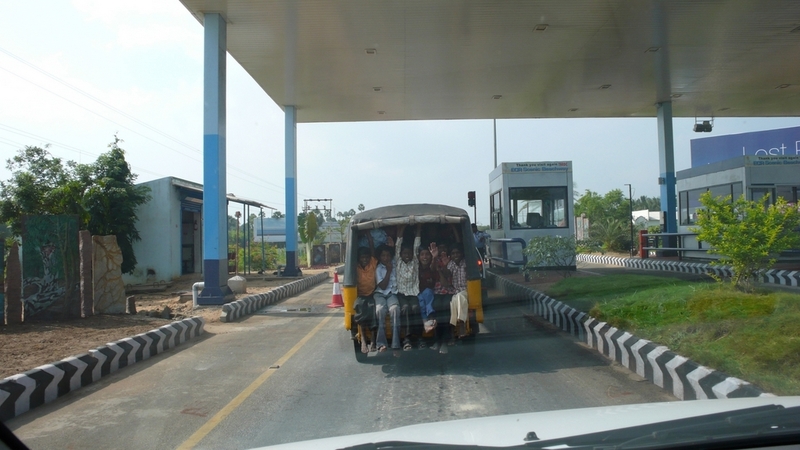 Three rows of boys waving from a three-wheel taxi preparing to embark on the express toll road. Horn-honking is the language of this road culture, and most large vehicles have notices on the back reminding the driver behind to honk. We asked John if he had ever thought of writing up the different patterns of honking and what they mean. The heads of the oxen team often swing in unison as they walk. 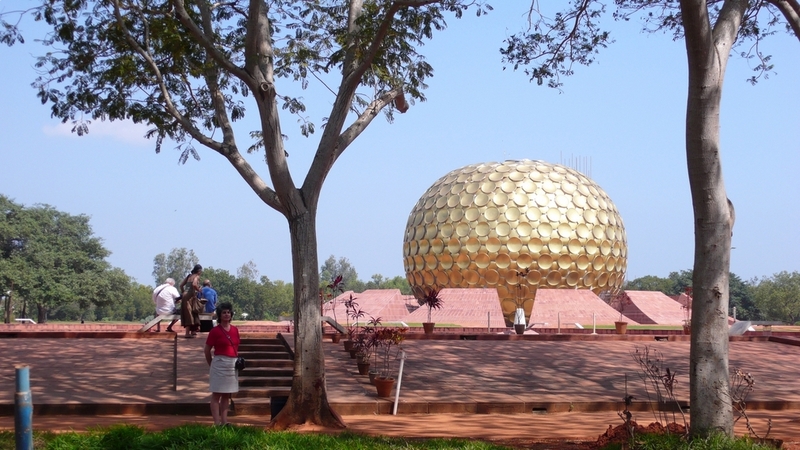 We drove on to Auroville, a community created around the shared vision of “The Mother,” Mirra Alfassa, a woman of Turkish and Egyptian extraction who grew up in France, and Sri Aurobindo, the founder of the Aurobindo Ashram. 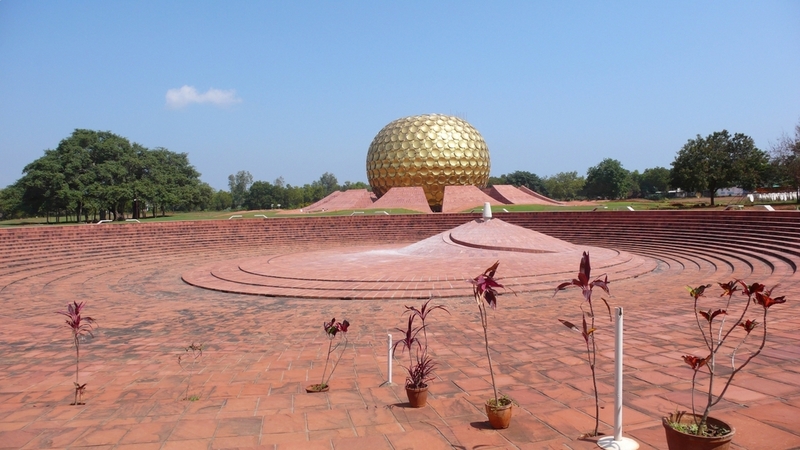 It is a huge territory conceived as an international city dedicated to divine consciousness, education and human unity, and while it welcomes visitors, all you can really do is walk through some lovely paths from the information pavillion to the Matrimandir, a huge, round gold dome that glitters in the sun. Somehow it failed to impress me from the vantage point of our visit. While I am sure that this community was set up with the highest ideals, and has attracted many people of good will, it left me wondering if, like many a lofty concept, it is a dumping ground for the actively lost, a place overrun with people who need to be told that they have found the right path. That said, when I came home, I could not miss the contrast between its lofty goals and the declaration of the small Quebec town of Hérouxville and its attempts to secure its sectarian purity. The similarity in the sound of the names underlines the differences and the directions our societies are moving in as we, in Quebec, move towards a suffocating dominance by the largest ethnic group. When we arrived at the dome we met an Israeli couple who asked if we could take their picture. He was a tall man, originally from New York, who reminded me of Randal Marlin and his father, Spike. He left before I could pursue this with him. 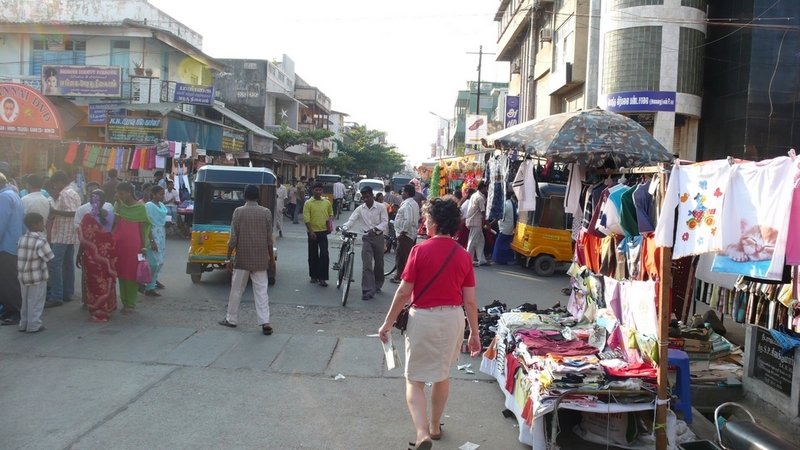 Most of the people that we saw were Indian tourists dressed in their lovely saris. The men tend to dress Western, but the women have retained their historical attire. We noticed this even in the streets, where the women are elaborately and colourfully dressed, even while seated on a motorcycle. The standard historical costume of the men is a dhoti, which is a white wrap-around skirt that is usually folded about knee-height, pulled back to the waist, and bundled at the stomach to keep it in place. When released, it falls to the ankles. White is standard, and the coloured, dressier ones are called lhungi. They suggested to me a costume invented by a wise old woman who knew that her young men needed to fiddle endlessly, and so developed the perfect costume to keep their hands busy. The men wearing these seem to be endlessly stretching and retying them giving them a harmless occupation. By contrast, the beautiful saris catch the eye and often deflect it from the wearer, forgiving poor posture and leveling the field of physical beauty in the process. When I mentioned later to my son that these beautiful outfits almost seemed conceived for this purpose, he responded that if I did not have two grown sons, he would have suspected me of being gay and that he was not fooled for a minute by the costumes. Perhaps I am mellowing. That day walking through the Auroville property, I noticed that Sheila was drawing a lot of looks from both the men and the women, but particularly the women. One lovely young woman walking with her family even stopped and greeted her enthusiastically. Does her Turkish ancestry remind them of “The Mother” I wondered? We were perplexed. The people are very tolerant and accepting and there seems to be an attitude of respecting others regardless of what they look or dress like, but we eventually solved the problem when I realized that her off-white skirt strongly resembled a man’s dhoti. The sari covers the legs entirely, so it would seem that such attire would strike people locally as looking very masculine. Not surprisingly, Auroville has a large (inefficient) restaurant for visitors as well as a couple of boutiques. The architecture of these was very nice. It took us an age to get any attention to eat, though, and by then, the only boutique that looked interesting had closed for some reason. John brought us to our new hotel, the Annamalai in Pondicherry, a luxurious establishment with a four-storey high lobby and a pool on the roof, but sitting right on a busy thoroughfare and outclassing any building in the neighbourhood. 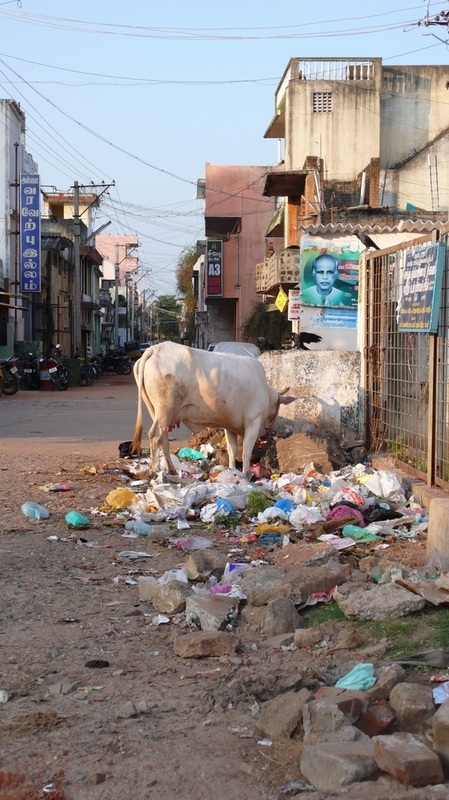 Cattle mingle with pedestrians on the street, and John told us that they eat what they can find, but particularly like the political posters that are placed around election-time. It seems that they use different glue, probably made from flour. More contrasts. 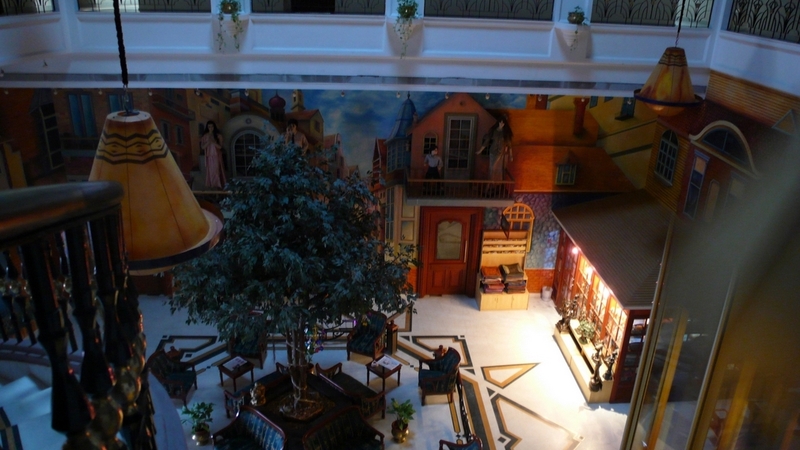 View from the mezzanine of the five star Annamalai Hotel in Pondicherry. The approach to the front door of the hotel. We headed out of the hotel into the press of people, noise, smells and vehicles, determined to be by ourselves. Depending upon a map, we decided to take a long walk and visit a local museum on the other side of town. 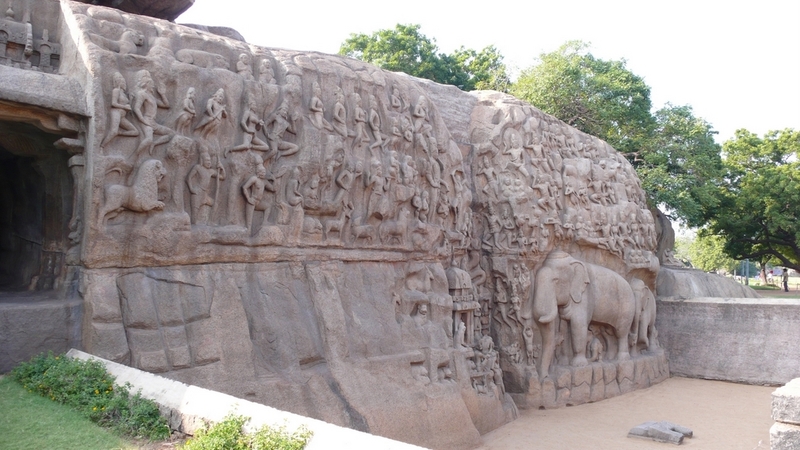 We anticipated being swamped by curious onlookers and surrounded by beggars as we had been at the public sites in Mahabalipuram. To our surprise and delight, this did not happen. In fact, we may as well have been locals, in spite of Sheila’s 'dhoti.' Walking across town, we could see the French influence. 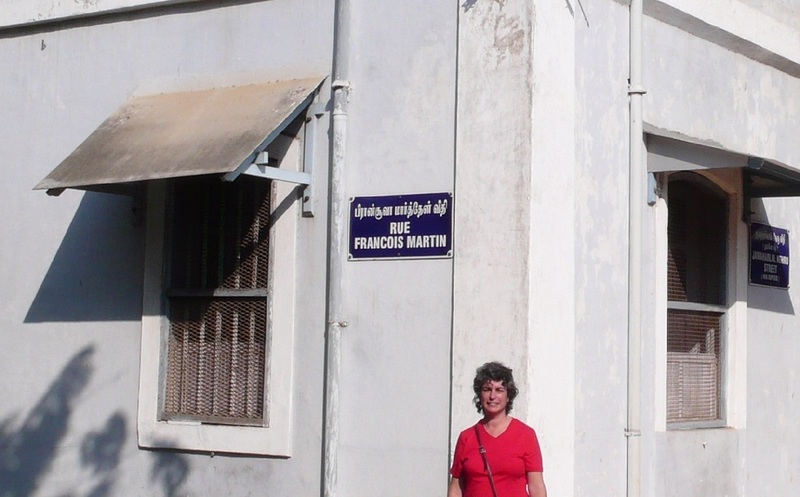 Pondicherry had once been a French trading colony, and some of the architecture and names reflected this. In fact, some of the bilingual street names were in Tamil and French. The Office de la Langue Française would have been pleased. The architecture and even some road signs remain from the French period. Our route took us along busy shopping streets and through the market place, but the street names were often not posted and the map was only a rough guide. Access to the museum cost 2 rupees (about 4 cents) and the information inside was really cultivating local pride, like small municipal museums everywhere. At the same time, the items on show would have been a celebration of antiquity back in Canada. Photography was forbidden. We also walked down to the shore, where there were tourists, beggars and street sellers. Every public square also seems to celebrate Ghandi, and seeing his statue is somehow familiar and reassuring. Statues and reminders of Ghandi are ubiquitous and somehow reassuring. Returning, we were trailed for a while by two young boys, begging. I finally gave them something in exchange for their picture. 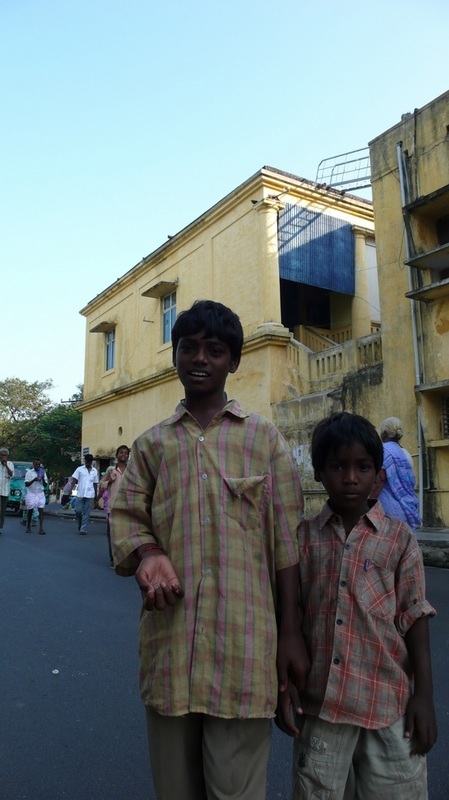 Two young boys asking for money, a pen, or anything. Perhaps just acknowledgement. 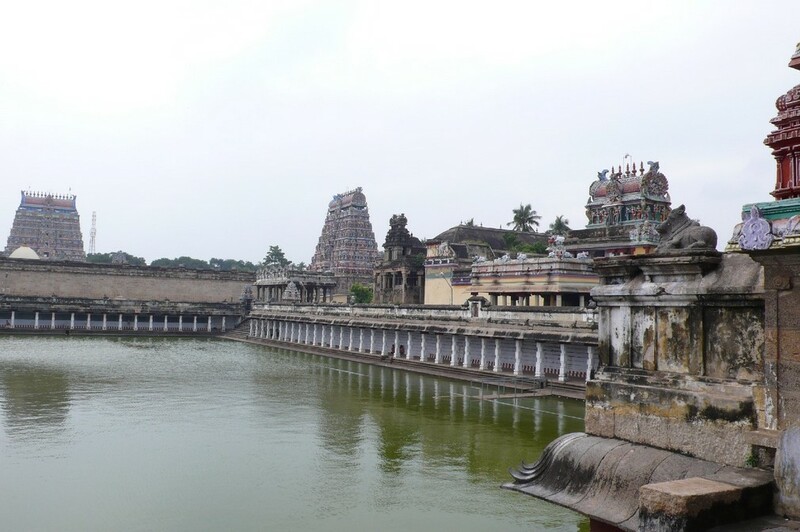 We left early as planned for Thanjavur with plans to stop at Chidambaram, a 35-acre temple property. In the meantime, John told us more about his own life. He is a Syrian Christian. That means his ancestors converted to Christianity around 52CE, the year St. Thomas is said to have arrived in Kerala. People in India, he said, believe in arranged marriages and therefore, while the communities coexist comfortably, there is not really any intermarriage. He himself chose to marry so his mother would have a family companion. He is the older of 2 sons, and the younger one is studying to become a priest. His wife, Sheena, and he have a young daughter, Rosalie. We pulled up in a busy non-descript street with people milling around, and when we got out, John introduced us to the new guide. A slightly older man, he was Hindu. 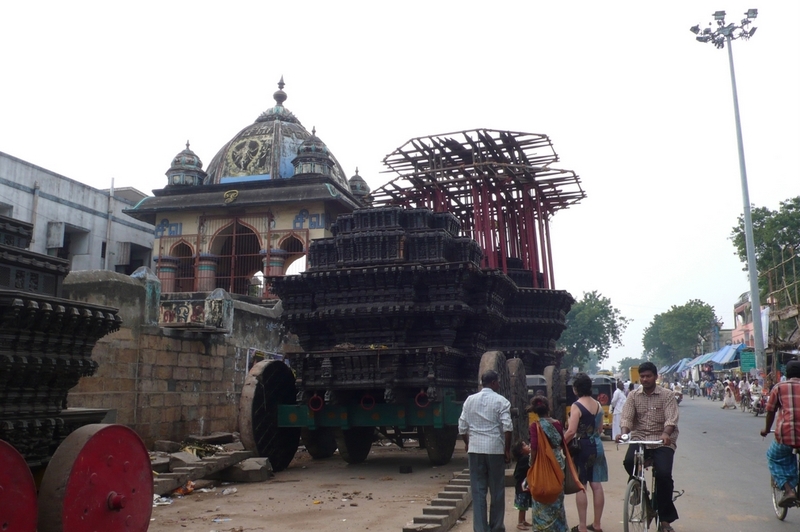 The guide showed us huge, ancient festival chariots sitting on wooden wheels that the faithful pull through the streets under temporary canopies in an annual celebration. They and the canopies are decked with flowers. Some of the vehicles are hundreds of years old, but a new one, with huge iron wheels, had recently been donated by a wealthy congregant. An old festival chariot with a new one beside it. We walked to the temple along a road under the temporary wood canopy. When we arrived the guide explained that the temple has four entrances, as seen in the picture. They are massive edifices tapering as they rise and are painted bright colours. This temple is supposed to be the only Hindu temple in India not owned by the government. Priests maintain it privately. The entry - in fact the whole place - was stunning. The temple is dedicated to the Nataraja manifestation of Shiva and the cosmic dance of bliss. I learned that the principal gods of Hinduism are three in number, making it similar to the Christian Trinity. God the creator is Brahma, while God the Protector is Vishnu, and God the Destroyer is Shiva. Where it gets confusing is that they are all married, and Vishnu and Shiva have offspring, but if you ignore the offspring, you remain focused on the real gods – and their manifestations! Generally Shiva manifests himself in many forms such as Nataraja, but Vishnu became man and accepted to be reincarnated nine times, and will be reincarnated only one more time in the future, when evil is vanquished. Familiar names such as Rama and Krishna are in fact incarnations of Vishnu. While the interpretations change with different sects, a problem has recently arisen because one school of Hindu thought has decided that Gautama Buddha was an incarnation of Vishnu. This is problematic, because it means either he is the tenth, or one other has to be demoted. Most of the temples have representations of the 9 incarnations of Vishnu, and they cannot start erasing one. When you realise that the Buddha lived 2500 years ago, you start to see how slowly things actually change in this culture. Give it another 2500 years, I suggested to the guide, and Mahatma Ghandi will have to be recognised as a manifestation of Vishnu. The guide, a religious man with a sense of humour, laughed comprehendingly but nervously at this suggestion. We often saw a symbol of the two interlinking triangles that form the Star of David, sometimes pictured near swastikas. Both of these symbols are older than Europe and carry none of the baggage that they would in our culture. Two of the four gates to the temple grounds can be seen beyond the temple pool. The four gates of the temple are massive structures that taper into the sky and can be seven or more storeys high. The temple grounds also include a pool used for ritual bathing. A few days after our visit we heard in a news story that several pilgrims had drowned while bathing. When it came time to go into the temple proper, there was worshipping in progress and we objected. The guide encouraged us on, saying that we would disturb no-one, but that we should go on by ourselves and he would wait. He told me this was because they would ask for a donation, and he had already given. He said I should give whatever I felt comfortable giving. There were no rules. Anything would be appreciated. He encouraged us to walk around the outside of the worshipping, all inside a huge building. Looking through the crowds, where we were not allowed to take pictures, we saw young men naked from the waist up performing ceremonies for the faithful. There were wide corridors surrounding the centre of worship, allowing us to walk around it through these large passages. The far one was fairly isolated from the worshippers, but there were priests there who stopped us and insisted that we had to give a donation. They were rather aggressive, and said the amount should be at least 200 rupees, which surprised me. Obviously the guide had not prepared us well or knew this would happen. I gave the 200 rupees, and the priests asked my name and where I was from. They insisted that I fill in a form, which seemed reasonable enough. The hotels asked for feedback and a lot of places ask you to sign your presence. I began to suspect that something was different when they wanted our mailing address, phone numbers, email address and so on. Finally one of them told me to fill in what my monthly donation to the temple would be. At this point, I stopped and told them that I could fill in whatever they wanted, but there would be no monthly donation. They backed off at that and we moved on, no longer hassled. It confirmed my impression though, that everyone has his hand out, as though we were in a culture of beggars. Sheila receiving a blessing. The elephant skilfully accepted a few rupees. Being already in the habit of tipping the guide, I gave this one a slightly smaller tip and suggested that he could give whatever he felt was appropriate to the priests the next time he went in. This also set me to asking him what these particular priests do for the community. The answer, once he understood my question, was nothing. This is not true of all of the temples. Some feed the poor and are very involved in the community. That seems to be in part how the government provides welfare. Having taken over the temples, the government continued to encourage the historic role of the temples and the priests in the community. The difference in the Chidambaram temple is that it is privately owned and has adamantly refused to follow the example of the other temples and transfer ownership to the government. The result seems to be that they are doing all they can to make their way, but not really pulling their weight beyond their walls. 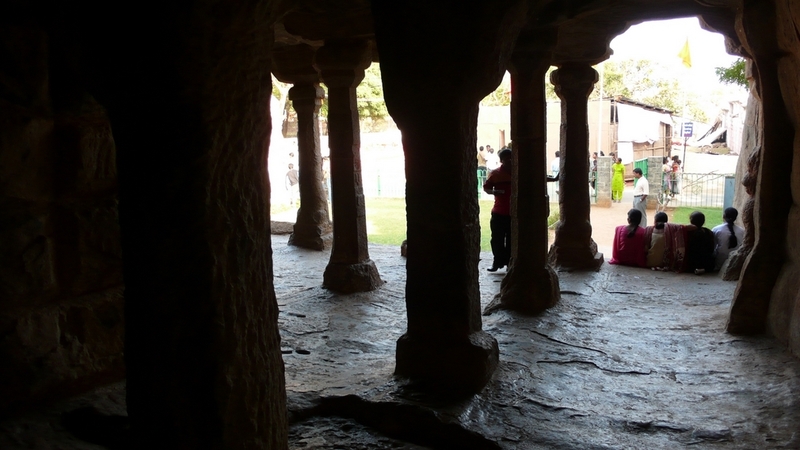 When we got to Thanjavur to see the Brihadishwara temple, the regular guide could not make it and his replacement, a young man named Shandar (for the second son of Shiva and Padmavati) took us around. He loved his work and was very enthusiastic about all he told. Most of the guides speak English after a manner, but it is very hard to understand them. Also, there seems to be a tendency for the guides and public staff to have the answer to any question you ask, whether they have any idea what you asked or not. This led to a lot of strange answers to our inquiries, not just of the guides, but also in the hotels. Shandar was a different sort. He had a ready, and never brief, anecdote for any and every question we asked, and seems to at least have understood the general sense of our questions. As a result, we learned a lot from him. When we asked him why Brahma did not seem as present as Shiva and Vishnu in the temples, he gave us the long answer, which was basically that the other two had caught him out in a lie. When we asked him about the sons of Shiva, we learned about their sibling rivalries. He was very interesting and informative, given that we had the time to listen. We were learning in any case that we had no control over or responsibility for how we spent our time, and we might as well just enjoy ourselves. Shandar also showed us the museum with its fine Chola bronze. 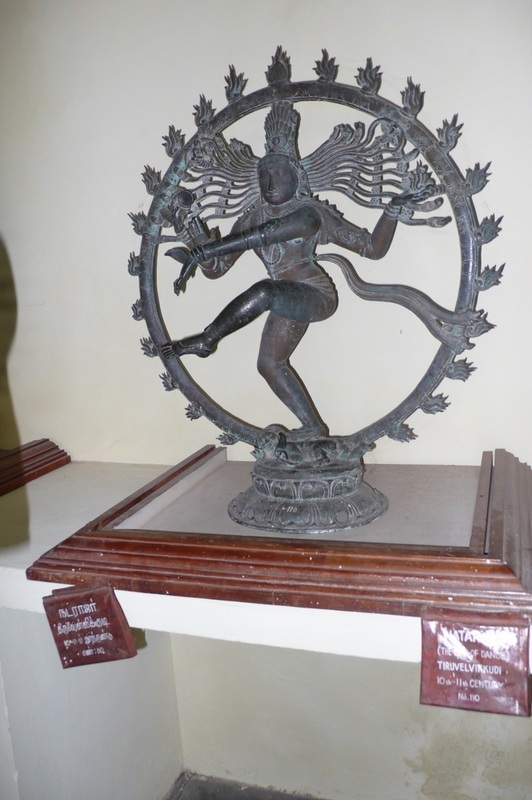 This included several representations of the dancing Shiva. 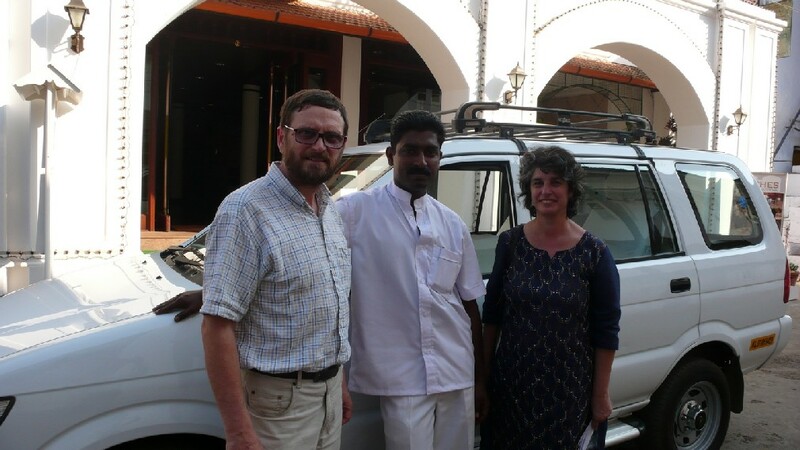 We arrived at the next luxurious hotel, called Parisutham, in Thanjavur, but it was not conducive to sleep. Although we were given the Honeymoon Suite, it turned out to be just above the kitchen, which stayed open late, and then began again early in the morning. I spent the night listening to a clock loudly call out the quarter hours with the appropriate number of gongs on the hour, but felt that I had won some kind of victory each time I realised that I had missed one of the hours. That meant I must have slept through it.